Knowing your customer will improve how you bid to them. Use bidHD to automatically track your company's success with your customers. Instantly see your top customers by current projects (based on revenue) and by hit ratio. Assign a customer team leader from your company. 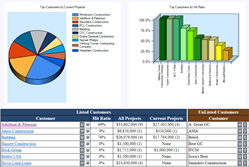 Assign customer's yearly total volume potential. Enter the customer's decision makers. View pending projects with the client (automatically updated when adding the customer to a project). View all projects with this client within the last 12 months. 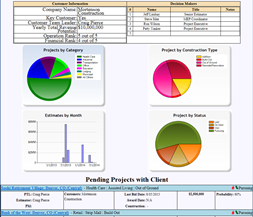 Quickly see what type of projects you are bidding with the customer. A chart to see how much you have bid with the customer by month.